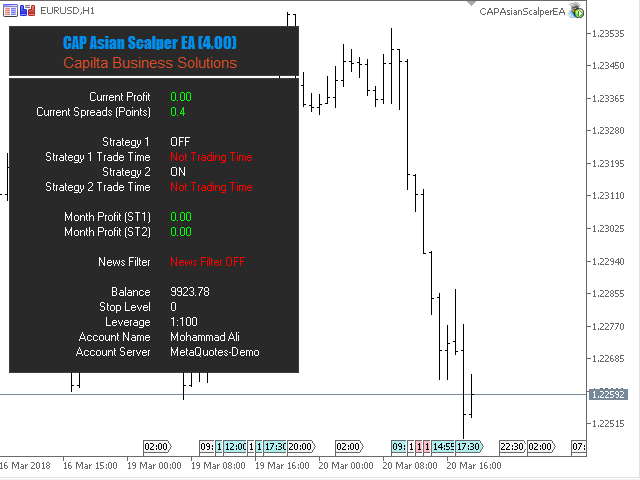 CAP Asian Scalper is an Expert Advisor that uses range breakouts strategy to enter trades when the market is the most quiet. It will scalp the market for small price deviations. This EA will need a good broker with small spread to work successfully. 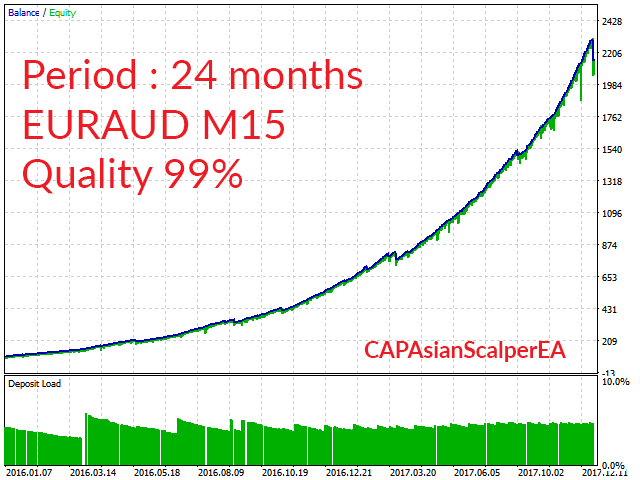 It is fully optimized for AUDCAD, EURAUD, GBPAUD, GBPCAD, GBPCHF and GBPUSD. 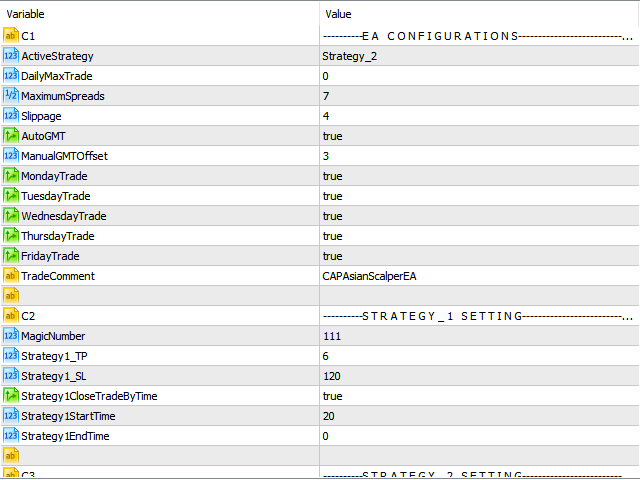 The trades are based on several indicators and it's not a tick scalper EA. It need 1:300 leverage minimum, and a low spread broker. It is recommended to use a low spread broker and a VPS. You can start using it with $100 only. Optimizable for all currency pairs (low spread is advised). The Expert Advisor uses tick data. Please backtest EURUSD M15 in "every tick" mode and play to find the best parameters. 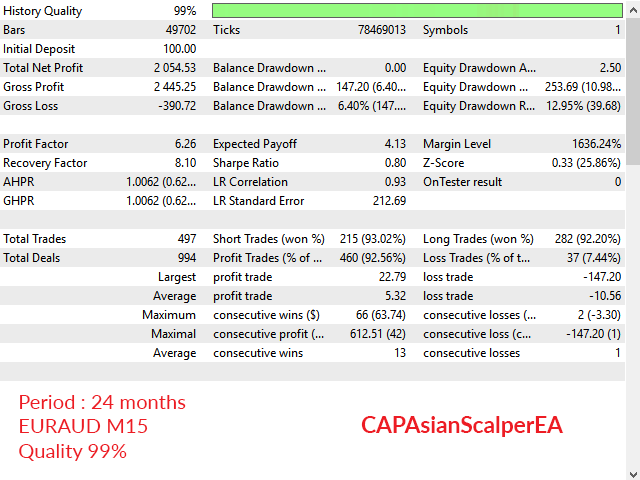 CAP Asian Scalper is developed for M15 charts, but it can be optimized for any currency pair or timeframe. Try the demo now! DailyMaxTrade: Maximum trade in daily. 0-mean disable. MaximumSpreads: Maximum spreads for an open trade. If the current spread is higher than what you receive in a setting, then the robot will not trade. Please note that the spread is in pips. Slippage: Allowed slippage when opening a deal (in pips). AutoGMT: if True, EA auto calculate your broker GMT time zone. You need tick the "Allow WebRequest" option and add "http://time.is/UTC" to use this function. Otherwise it will not work. ManualGMTOffset - if AutoGMT off or in backtest, EA fellow ManualGMTOffset for time zone. MondayTrade - FridayTrade - Enable trading day of week by true/false. KEEP IN MIND: This EA build for Asian market only, so this is very important to put correct broker time zone into 'ManualGMTOffset'. MagicNumber: Magic number for strategy_1. Strategy1CloseTradeByTime: EA close trade by Time. Strategy1StartTime: Trade start time for Strategy_1. Strategy1EndTime: Trade end time for Strategy_1. Max Hour to Trade From StartTime - Max hour to trade from StartTime. MagicNumber: Magic number for strategy_2. 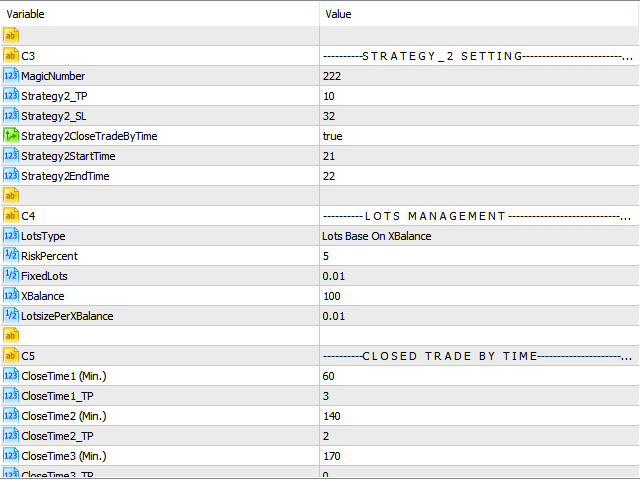 Strategy1StartTime: Trade start time for Strategy_2. Strategy1EndTime: Trade end time for Strategy_2. RiskPercent - Lot is chosen automatically based on percentage of the loss. CloseTime1_TP - CloseTime6_TP: Takeprofit in Pips. Example: Your CloseTime1=60 and CloseTime1_TP=3 (pips). So if your open trade to close by your initial takeprofit after 60 minutes EA with fellow new takeprofit level as CloseTime1_TP=3. EA has 6 different time and takeprofit level. News Filter: To enable News Stop Trading (not work on tester!). Current Currencies to display the news: if True, EA only filter current chart symbol. 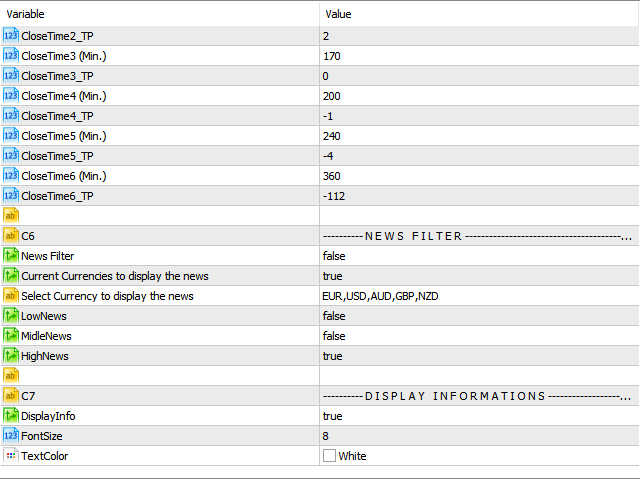 Select Currency to display the news: if Current Currencies= false. LowNews, MidleNews, HighNews: Filter news importance level. ShowNewsLine - Show news time on chart. to the list of URLs for WebRequest. To do this, open Tools > Options > Expert Advisors. Check the option "Allow WebRequests for listed URL:". Add the following: "http://ec.forexprostools.com","http://time.is/UTC" and press "OK". The EA takes news from the specified websites. --- Bugs found in the old version which caused the EA to stop trading. Fixed this problem.